The other week I presented this week at something co-ordinated by agency, MEC, and Google. The whole shebang was done on behalf of MEC’s clients, and between us we filled the Bafta theatre on Piccadilly. The theme for the whole event was So-Lo-Mo. As a handy/catchy phrase it neatly captures what are clearly the cornerstones of Google’s approach for the next couple of years. But it also decsribes the new dimensions the web will be take on further as ‘social’ takes on the dispersed model discussed by Pats recently. It was largely product demo stuff from Google – which is always excellent – and my gig was to provide some planner-y thinking upfront. I thought I’d scope out some of the stuff I talked about. I began by stating that I saw So-Lo-Mo technologies sitting squarely in the tradition of what BJ Fogg called ‘persuasive technologies’. They reframe tasks by making them easier, or more fun. And they’re everywhere. This is largely because they’ve become more intuitive than they ever were. The old joke that there are only 10 types of people in the world (those who understand binary, and those who don’t) is still true. And it’s worth repeating just to highlight just how little the distinction actually matters these days. Because no-one cares, or needs, to know how anything works any more. They just need to know that it does. When you’re not scared by technology any more, you’re not easily impressed by it either. So technology has reached the next Maslovian level for people – it no longer can simply be, it has to do. And since so much technology does just that, expectations have now been raised everywhere – off- as well as online. Service provision in the real world now has to match up to the convenience and speed of the best digital interface. Which is why So-Lo-Mo asks a much bigger question of us than merely when or how to deploy these technologies. It means those technologies need to do something useful. It means we have to work harder everywhere. And So-Lo-Mo means we have to think more about context. Frame of mind, location, time, and all that stuff. In media we’ve always done this. But I think we got a bit lazy. So-Lo-Mo offers us a huge challenge, and a huge opportunity. Including beyond digital. For instance, I live near Crouch End in North London. 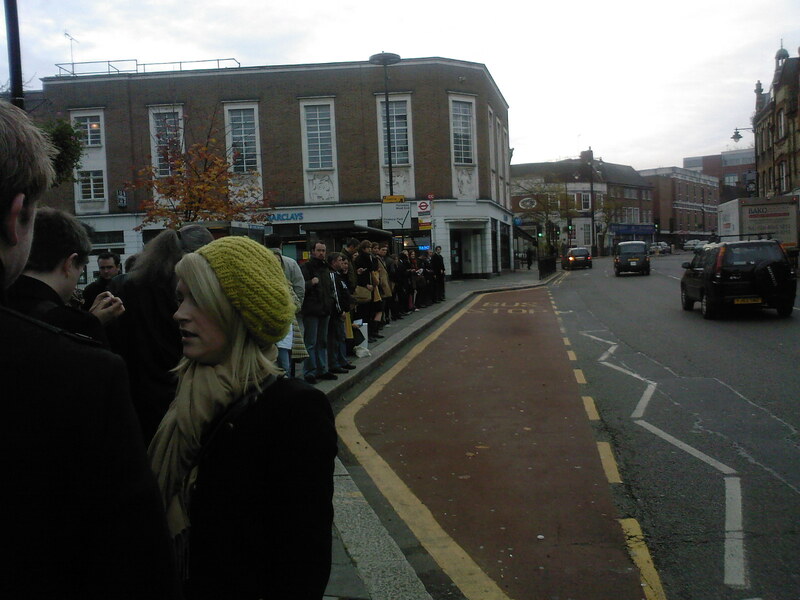 When people who live in Crouch End wait for the bus in the morning they wait like this. A nice orderly queue. Very relaxed. There’s no tension here, the rules are clear and closely observed. No calm or rules here. It’s every commuter for themselves. This photo is from Finsbury Park, five minutes down the road. These are everyday images of hugely differing experiences of pretty much the same event. They’re happening a couple of miles apart. They should make us question our assumptions and some of the generalisations we’d normally make. 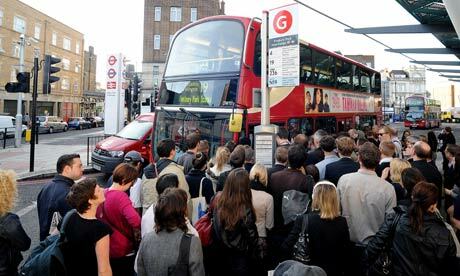 For example, when we talk about the ‘commuter routine’, what exactly do we mean? When we think of ourselves targeting a ‘London audience’, do we think of all those people being exactly the same? 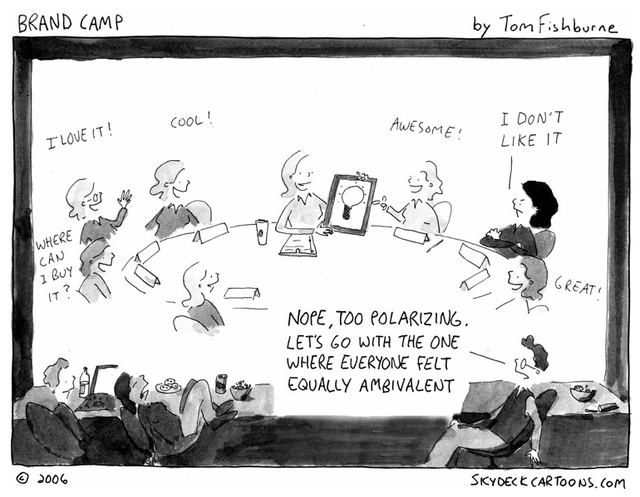 And when we plan and buy a ‘6 sheet campaign’, are we really thinking that everyone will be in the same frame of mind, will feel the same way when exposed to it, and will respond in the same way to what we tell them? So the lessons of So-Lo-Mo should not be limited to what we do digitally. Because of intensified consumer expectations everywhere we need to think in a fresh way not just about audiences, but about individuals. But the opportunity is equally big: it’s never been easier to access, anticipate and respond to the context that people become exposed to brands and services. And if So-Lo-Mo is about anything, it’s about context. So, all we have to do is to create communications that are more relevant, more useful, and more personalised. People can see advertising, but ideas are something they can get hold of. They are something for people to share, talk about, go to, follow and participate in. Ideas give a reason for brands to exist in any space they’re in, whether that space is a So-Lo-Mo one or not. Get the idea right first, then build the channels around it to recruit, amplify, sustain, whatever. New technologies have supercharged our ability to make ideas more social, more location based and more mobile, so it shouldn’t be hard with a good idea. So-Lo-Mo channels are undoubtedly converging with and super-charging more traditional media and the relationships we have with them. X Factor has just started allowing views to tweet their votes in the US. Far from killing off mainstream hits like this, social media has actually been assimilated as part of the reinvigoration mass viewing experiences. Social is becoming fully integrated into the experience, and surely advertising has the opportunity to do the same. Here I defer to the great debate that happened over at John’s blog, where Mel swept in to defend/explain the entirely modern deployment of smart social and effective broadcast channels in service of the same big idea for Yeo Valley. The bigger opportunity in media might be how to place content in the right broadcast environments to maximise engagement. 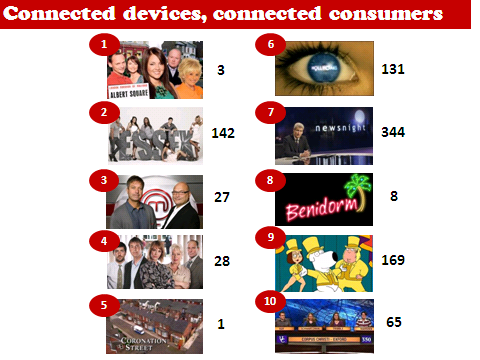 This will inevitably take on a more granular shape in due course – because you just need to look at the rankings in the chart below to see how the most engaged and interactive, dual-screen constituencies are not always watching the biggest draw programmes. Perhaps this will began to impact on the way we think about programming strategy and the way we evaluate campaign delivery. It should certainly start to inform the way we think about response mechanics. And it will also bring about a return to the idea that people react to media not just as something consumed on the consumer’s own terms, but as something that’s happening in the moment, as ‘live’. Empathy is critical to creating personalised interventions. As people, our attention is drawn to things that directly relate to us and our own experience. And it’s never been easier, or more important, to be as personalised as possible with our communications. 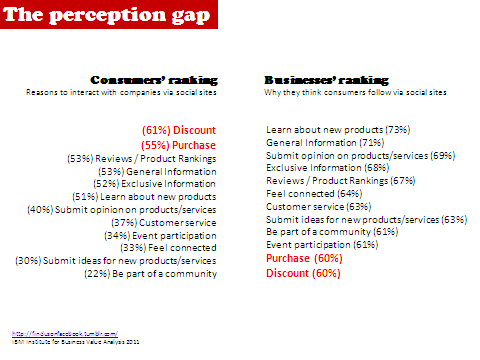 But right now there remains a perception gap that plagues businesses. IBM did a study to compare what consumers want from businesses as a result of following them in social spaces, and what those businesses perceive consumers to want. Getting discounts and making a purchase were top of consumers’ priorities, but assumed to be at the bottom by businesses. Equally, there’s quite a disconnect between businesses’ expectations of creating connections or a community, and consumers’ desire to do so. Building empathy into consumer interaction, therefore, offers a real competitive advantage. Executing a So-Lo-Mo strategy requires understanding consumer needs and their change over time. For more on this, have a look at this excellent presentation from earlier this year. I admit I plundered it unreservedly for my own presentation. But for empathy generally, no discipline does that better right now than UX. UX is the persuasive technologies mantra in excelsis. If we can understand the psychology of UX design perhaps we might be able to extrapolate and apply it to brand interactions of any form. Of course, there’s one institution that has very little to do with context, empathy, So-Lo-Mo or any of the ideals I was talking about, and everything to do with a brand-centric, artificial, way-we’ve-always-done-things attitude. Here I quoted some of Neil’s thoughts on this pernicious influence, and urged brand owners to get out and see how people interacted with their brands in the real world. And that’s it. Deck is here – would love to hear what people think.